I met Raphael outside of the Shangri La a few weeks back. He said he got HOLD TRUE because he stays true to the course. Got on May 21, 2011 by Mr. E at Cherry Blossom Studios in Fayetteville, NC. 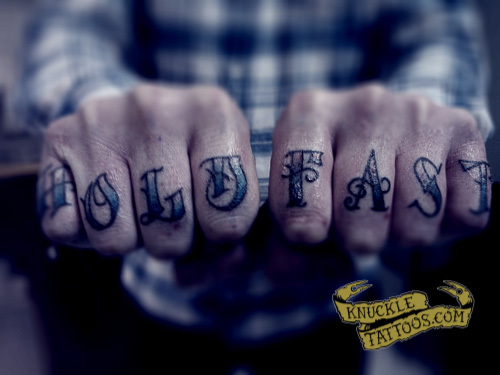 hey man, im Jesse Bink, i’m a tattoo’er from NYC, and my HOLD TRUE knuckle tattoo’s are based on a feeling i have that you should hold true to your convictions whatever they may be, mine being Straight-Edge… the small staggered knuckle set was a dare by a good friend of mine after calling me out on a “i will get paramore knuckle tattoo’s i love that band so much.”…. so i cant back out of a “you wont” challenge… hence, paramore knuckles… i DO love me some paramore though… dont like it? fight me. Tonight I saw Thee Oh Sees destroy the Beerland patio. I had to stand on the patio fence in order to shoot pictures. Dangerous, dangerous! 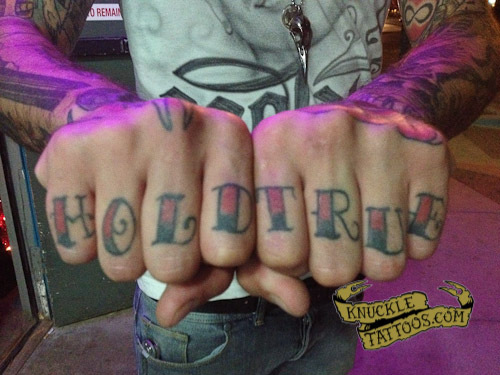 After the set I talked to Petey Damnit from the band and got these pictures of his knuckles. If you get a chance to catch this band live, don’t miss out. Don’t miss ’em, you will thank me. These rockers come straight out of Brussels Belgium, courtesy of Saint Empire.